Copyright © 2013 Samwel Morris Lifumo Symekher et al. This is an open access article distributed under the Creative Commons Attribution License, which permits unrestricted use, distribution, and reproduction in any medium, provided the original work is properly cited. In accordance of the Creative Commons Attribution License all Copyrights © 2013 are reserved for SCIRP and the owner of the intellectual property Samwel Morris Lifumo Symekher et al. All Copyright © 2013 are guarded by law and by SCIRP as a guardian. Background: Acute respiratory infection (ARI) is a leading cause of morbidity and mortality in children under five years of age in developing countries with viruses contributing significantly to this problem. The recently identified parvovirus, Human Bocavirus (HBoV), has also been associated with ARI. Objective: To determine the frequency of HBoV in patients with ARI. Materials and Methods: Samples from 125 consenting patients with influenza like illness signs and symptoms were collected. DNA was extracted from these samples using the QIAamp DNA blood mini kit (Qiagen, Germany). Conventional PCR was carried out and the amplicons were examined in 2% agarose gels stained with ethidium bromide. This was followed by sequencing of the HBoV positive samples. Results: Twenty one (16.8%) patients were found to have HBoV infection. Males (n = 61.9%) were mainly infected with HBoV. Local HBoV strains had 98.9% - 100% similarities and were found to cluster together with other strains obtained elsewhere. Conclusion: These findings suggest that HBoV plays a role in respiratory tract infections in children in Kenya just like it has been found elsewhere. It also sheds light on multiple infections associated with HBoV infections in Kenya. Acute respiratory infection (ARI) is a leading cause of morbidity and mortality in children under five resulting in approximately 1.9 million of deaths worldwide annually [1,2]. Viruses such as respiratory syncytial virus (RSV), parainfluenza viruses (PIV), adenoviruses, rhinoviruses and influenza viruses are recognized as the most common etiologies of ARI. Other currently identified viruses among ARI patients include human metapneumovirus (HMPV) , severe acute respiratory syndrome coronavirus (SARS-CoV)  and the human bocavirus (HBoV) [5,6]. The HBoV belongs to the genus Bocavirus of the Parvoviridae family and Parovirinae subfamily . Coughing, wheezing, and fever are the most common clinical findings with bronchopneumonia and bronchiolitis being the most common ultimate diagnoses of HBoV infection. Since the first description of HBoV as a possible human pathogen of lower respiratory tract infections in children , HBoV has been detected in at least 19 countries in the five continents of Africa, America, Asia, Europe and Oceania infecting all persons with children and infants being the most susceptible [7,8]. This study sought to determine the frequency of HBoV in patients with signs and symptoms of ARI and also determine the genetic relationship of locally detected HBoV to other HBoV strains and prototype strains such as ST1 and ST2. A total of 125 patients with signs and symptoms of acute respiratory infection participated in the study. Eligible patients were children aged ≤5 years. They presented with a fever of more than 38˚C, chills, malaise, dry cough, and among other respiratory disturbances (running nose, sinusitis, epiglotitis, laryngitis). Consent was obtained from either the parents or guardians of the children enrolled to the study. Thereafter, throat/oropharyngeal swabs were collected and placed into cryovials containing an in house constituted virus transport medium (VTM). The swabs and VTM were then placed in cool boxes at +4˚C for transportation to the Kenya Medical Research Institute’s (KEMRI), Acute Respiratory Infections (ARI) laboratory, based at the Center for Virus Research (CVR) in Nairobi, for storage at −80˚C until a time when processing was carried out. Genomic DNA and RNA was extracted from 0.2 ml of the collected throat/oropharyngeal swabs and stored in VTM using the QIAamp DNA blood mini (Qiagen, Valencia, CA, USA) and QIAmp viral RNA kit (Qiagen, Valencia, CA, USA) according to the kits manufactures’ instructions. The extracted DNA (5 µl) was used as a template for the PCR. The 50 µl reaction mix consisted of 10× PCR buffer (Life Technologies, Carlsbad, CA), 50 mM MgSO4 (Life Technologies, Carlsbad, CA), 2.5 mM dNTPs (Life Technologies, Carlsbad, CA), AmpliTaq Gold DNA polymerase (Applied Biosystems). The HBoV was detected using primers targeting a 254 bp region of the nonstructural 1 (NS1) gene (Sense 5’-TATGGCCAAGGCAATCGTCCAAG-3’ and antisense 5’-GCCGCGTGAACATGAGAAACAGA-3’) . The PCR procedure was carried out on AB 9700 PCR (GeneAmp® Applied Biosystem) and involved the following conditions; an initial PCR activation step at 95˚C for 10 minutes followed by 45 cycles of 94˚C for 30 seconds, 56˚C for 30 seconds, and 72˚C for 1 minute. Amplified products were detected using ethidium bromide stained 2% agarose gel electrophoresis comparing the size of the amplicons to standard molecular markers. The influenza viruses in the samples were detected using a real time RT-PCR protocol designed and distributed by World Health Organization (WHO) and the Centers for Disease Control (CDC), USA  to National Influenza Centers worldwide. This was done on an AB 7500 Fast Real-Time PCR (Applied Biosystems). The HBoV positive PCR products detected in this study were purified with ExoSap (Amersham Biosciences, Cleveland, OH) to remove unincorporated primers and dNTPs and directly sequenced using the big dye terminator method in an ABI 3500 XL Genetic Analyzer (Applied Biosystems). Nucleotide sequences were assembled using BioEdit . Phylogenetic trees were constructed by the neighbour-joining method and bootstrap analysis (n = 2000 replicates) to determine the best fitting tree for the NS1 gene using the method in the MEGA® software version 5 . Nucleotide sequences obtained from this study (JF313304-JF313321) were deposited to GenBank, a National Institute of Health (NIH) publicly available sequence database. Of the 125 patients recruited in the study period, 71 (56.8%) were males while 54 (43.2%) were females as shown in Table 1. The HBoV viruses were detected in 21 (16.8%) samples out of the 125 samples tested in this study. There were also 20 (16%) influenza A viruses (specifically influenza A (H1N1) pdm09 virus) detected in the same samples collected. No influenza B viruses were detected in the period of study. Of the 21 HBoV positive samples, 12 (61.9%) were detected in males while 9 (38.1%) were detected in females. Most detections of HBoV were in the month of November (n = 14; 66.7%) also shown in Table 1. Coinfections between HBoV and Influenza viruses were noted in only 3 (14.3%) samples that had any virus detected in them. Table 1. Distribution of HBoV positive specimens. 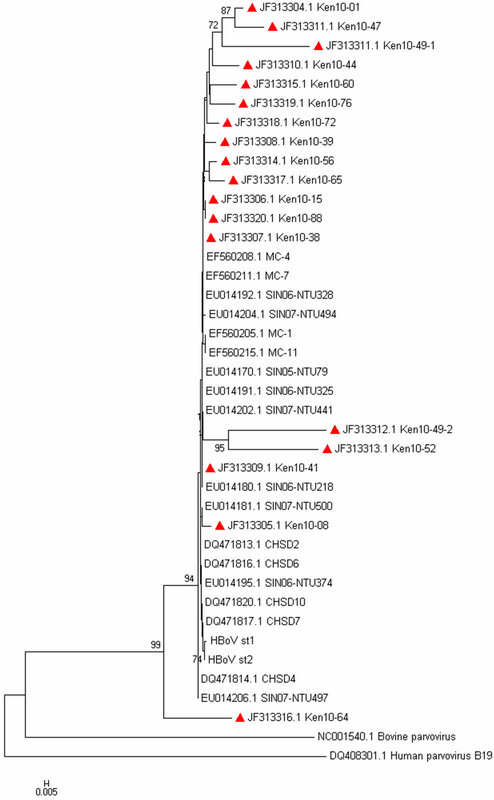 tively) and other similar HBoV strains obtained from GenBank as shown in Figure 1. Figure 1. Evolutionary relationships of HBoV. The evolutionary tree was inferred using the Neighbor-Joining method. The bootstrap consensus tree was inferred using 2000 replicates. The evolutionary distances were computed using the Kimura 2-parameter method . The accession numbers of the Kenyan HBoV positive sequences are JF313304-JF313321, followed by the country (Kenya), year (2010) and laboratory identity. Evolutionary analyses were conducted in MEGA® software version 5.
different sampling techniques. While the studies in South Africa and Egypt used samples from hospitalized patients, this study used outpatient samples. At the same time South Africa and Egypt tend to have a temperate climate in contrast to the tropic climate in Kenya. It has been shown previously that HBoV infection occurs predominantly during the winter season . The detection rate of HBoV in this study however, is within range of other studies which have had a detection range of between 1.5% - 19% [15,16]. Male patients (n = 12; 61.9%) in this study had slightly more HBoV detections when compared to female patients. This observation has been noted in studies carried out in South America , Iran , Brazil  and in China . This though is different from a study carried out in Saudi Arabia  where slightly more females were infected compared to males, and India  where both males and females were equally affected by HBoV. Coinfections of HBoV with other respiratory pathogens have been reported in other studies [8,21]. In this study, out of the 21 samples that had HBoV detected in them, only 3 (14.3%) had coinfections of HBoV and influenza A (influenza A(H1N1)pdm09 virus). The coinfection rates determined by this study are lower when compared to other studies which have reported coinfection rates of between 18% - 72% [6,14,22]. In countries with a temperate climate, HBoV frequently occurs during winter and early spring season [6,16], while in South Africa, HBoV was detected throughout the year although most detections were in autumn and winter . In our study, no clear seasonal distribution could be determined as the duration of this study (October to December) is too short to allow observation of any seasonal patterns. As a result more studies are required to determine the seasonal distribution of HBoV and its role together with other pathogens of the respiratory tract in disease severity. All of the 18 HBoV sequenced, HBoV aligned with the ST1 and ST2 reference strains, The multiple nucleotide sequence analysis showed an identity of 98.9% - 100% amongst the circulating strains, thus indicating a low degree of genetic variability as described previously . This study had several limitations. First, the study design used had a potential for sampling and selection bias of the patients. Second, the study was nested within an ongoing influenza surveillance study; the details of the patients’ clinical information were not available. Due to this, we were not able to link the virus genetic data with the patients’ clinical picture. Third, the study period was short which might given an underestimation of the true prevalence and seasonality of the HBoV detected in this population. Lastly, the detection panel used was not broad enough and a substantial number of potential copathogens were not be detected. In conclusion, despite the limitations of this study, these results provide important evidence that HBoV is involved in respiratory tract infection in Kenya. Additional studies will clarify not only the clinical and epidemiological significance of HBoV in the local population but also its presence in other clinical samples such as urine and stool specimens. We acknowledge the Director of Kenya Medical Research Institute (KEMRI), Director of Center for Virus Research (CVR), and National Influenza Centre staff for facilitating this study. We wish to also acknowledge the staff in the sentinel surveillance sites for provision of samples for this study. This work is dedicated to the late former Head of the NIC-KEMRI, Dr. Walter Ochieng. E. A. F. Simoes, et al., “Acute Respiratory Infections in Children,” In: D. T. Jamison, et al., Eds., Disease Control Priorities in Developing Countries, 2nd Edition. World Bank, Washington DC, 2006, Chapter 25. Z. Bi, P. B. H. Formenty and C. E. Roth, “Human Bocavirus, a Real Respiratory Pathogen,” African Journal of Microbiology Research, Vol. 1, No. 5, 2007, pp. 51-56. CDC, “CDC Protocol of Realtime RT-PCR for Influenza A (H1N1),” 2010. http://www.who.int/csr/resources/publications/swineflu/realtimeptpcr/en/index.html. T. A. Hall, “BioEdit: A User-Friendly Biological Sequence Alignment Editor and Analysis Program for Windows 95/98/NT,” Nucleic Acids Symposium Series, 1999, pp. 95-98. H. O. Al-Rousan, et al., “Human Bocavirus in Jordan: Prevalence and Clinical Symptoms in Hospitalised Paediatric Patients and Molecular virus Characterization,” Singapore Medical Journal, Vol. 52, No. 5, 2011, pp. 365- 369. A. K. Silva, W. A. de Mello, M. C. dos Santos and R. C. M. de Sousa, “Occurrence of Human Bocavirus Associated with Acute Respiratory Infections,” Revista PanAmazônica de Saúde, Vol. 1, No. 1, 2010, pp. 87-92.